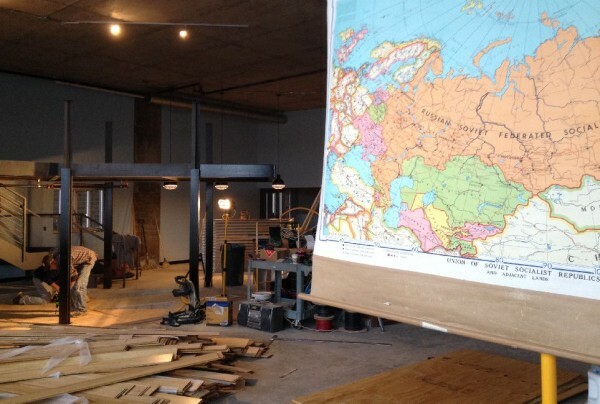 Lynn Lee (standing) works on a portion of the floor at the new Cargo Coffee, located in The Constellation. Lynn and his Brother Lee own the franchise. We dropped by the soon-to-be opened Cargo Coffee on the first floor of The Constellation building on East Washington Avenue to see how the Lee brothers were coming along. Lyndsey and Lynn Lee, who also own Ground Zero Coffee on Williamson Street have been working for months to transform the space into their second Cargo Coffee location. The space will feature of course coffee, along with some beer and wine offerings, some bakery items, and a drive-thru. Lyndsey says the store should be open by the middle of January and will feature the same travel theme as their original Park Street location, except the base color inside will be blue. This entry was posted in Madison, Willy Street and tagged Cargo Coffee, East Washington, Ground Zero Coffee, Lyndsey Lee, Lynn Lee, The Constellation by TheEastSider. Bookmark the permalink.